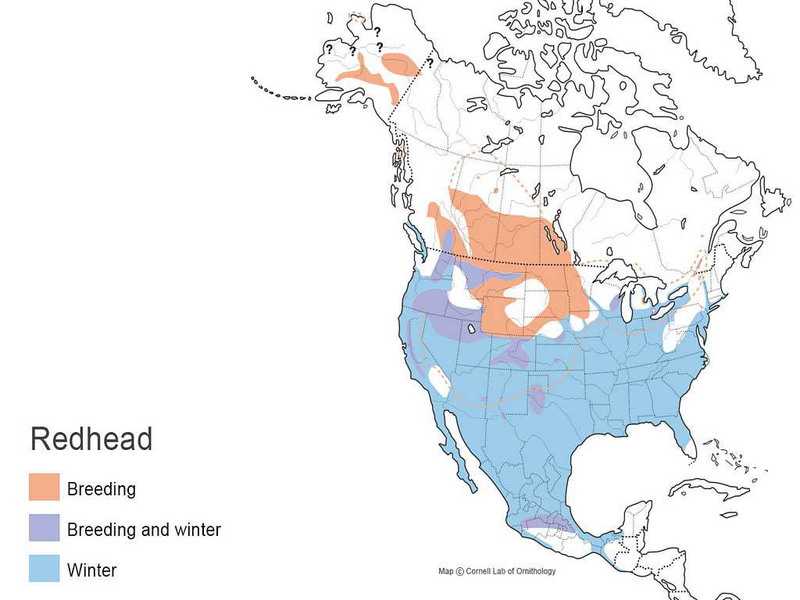 Redheads breed in the northern prairies of the United States and Canada and the intermountain marshes of the west. They prefer non-forested environments with water areas sufficiently deep to provide permanent and fairly dense emergent vegetation for nesting. 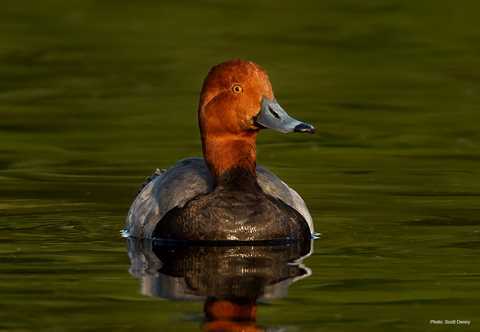 Of the diving ducks, redheads are the most common breeders in the United States. 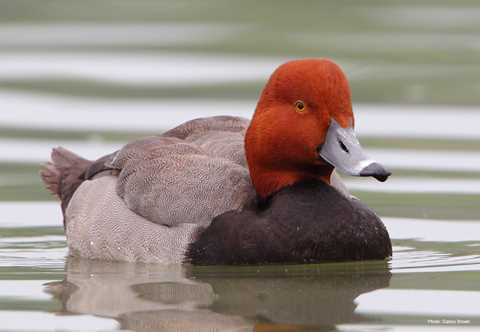 Female redheads lay an average of 7-10 eggs and are notorious for parasitizing canvasback nests. Average length: M 20", F 19"
Average weight: M 2.4 lbs., F 2.1 lbs. 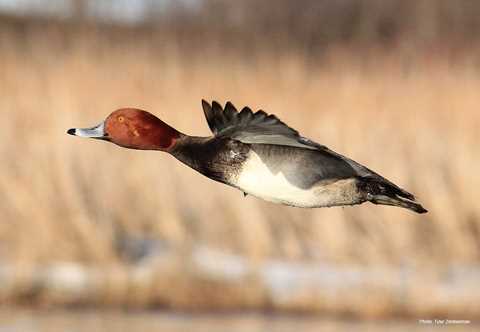 Male redheads have a reddish head and upper neck with a black lower neck, foreback and breast. The remaining back is a dark grayish color. The hind back and tail are brownish-black. A broad band of light gray extends across the dusky gray wing and out onto the primaries, which helps distinguish it from scaup. The legs and feet are gray, and the bill is light blue-gray with a whitish band behind a relatively wide black tip. 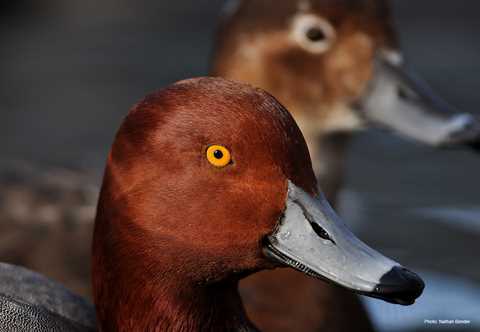 Female redheads have a reddish-brown head, neck and breast, with a buff white chin and throat and an indistinct eye ring and stripe behind the eye. 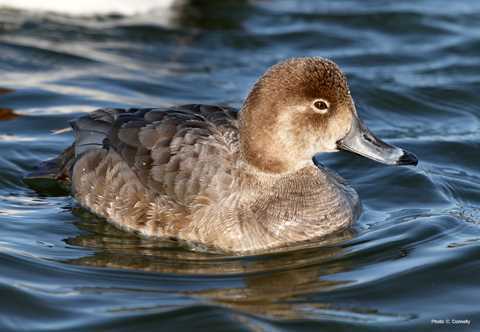 The flanks are warm brown, contrasting little with the breast, but with buffer fringes. The upper parts are darker and duller brown, with the upper-wing-coverts browner than on the male; otherwise the wing is similar to that of the male. The bill is duller than the male's, but similar in pattern. 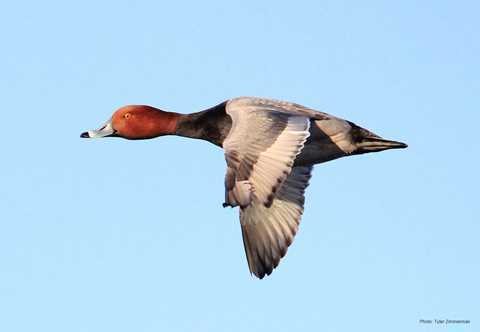 Redheads dive to feed on seeds, rhizomes, tubers of pondweeds, wild celery, water lilies, grasses and wild rice. They also feed on mollusks, aquatic insects, and small fish. 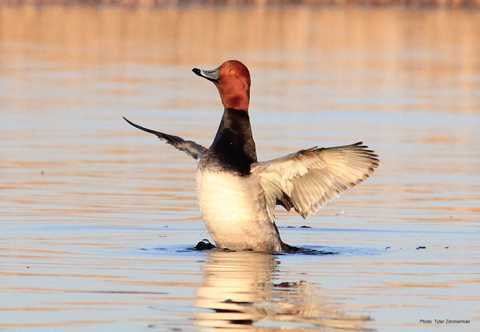 Enjoy a spectacular photo essay featuring the Redhead. 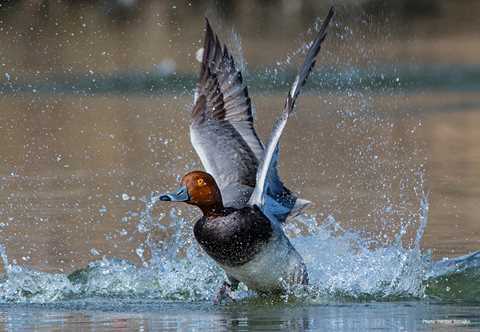 View more species in our Waterfowl ID gallery.